Family businesses are the bedrock of economies but is there a 'tipping point' when the family business comes of age and needs to professionalise? Family businesses make up more than 60% of all companies in Europe, according to the European Commission. Fiat, L’Oreal, Ikea and other family firms are integral to the European and global economy – and to our daily lives. Governments are agreed on the need to support family business but admit this is not always easy in practice when policy makers are unaware of the specific needs and challenges family firms face. Perhaps the most difficult – and under-discussed – issue for family firms is the step that comes after initial success, the move from growing business to fully-formed corporation. How should companies and the families behind them manage that transition? How to bring in the processes and structures that make a business more competitive without compromising the spirit and values that made it special? Most businesses are brought to life by one or two people and, if successful, they initially thrive as a family business. Successful growth eventually leads to a crossroads where the owner/managers, typically the founder and their family, realise they can no longer sustain growth through their own personality and business acumen. They must ‘professionalise’. Professionalising can be a dirty word to some entrepreneurs, who feel it is precisely by disrupting the market and questioning conventional wisdom that they have been successful. However, once a company reaches a certain size, it needs structures and processes in place to make it run smoothly and compete effectively in the open market, on an equal footing with competitors and business partners. Bottlenecks created by a founder’s unwillingness to delegate and lack of proper decision-making process are all too common. Greater still are the challenges of succession. It is a fact of life that the majority of family firms do not survive past three generations. Too often, the founder’s grandchildren or great-grandchildren have no appetite for the family business, or simply take for granted that will always be there, providing them with an income. Working alongside one’s family can be a difficult task. Families, even without the business element, can have their troubles: when a family becomes a firm the already complicated psychological relationships at play become much more intense. If a family business is to overcome the problems that the family structure may inevitably generate, and secure a long-term future, the company must have a degree of independence from the founding family. The best way to achieve such independence is through the creation of a family office – which separates the family from the business in all matters except for the shareholding issue but also allows for a relationship that encourages a company’s unique ethos to remain. This is a concept dating back to the sixth century when a king’s steward was responsible for managing royal wealth. In the 19th century, the modern family office concept really took shape as prominent families such as the Rockfellers set up family offices to manage the family assets. As many companies have experienced since, setting up a family office is not a retrograde action, but a sign that the business has reached maturity. By laying out distinct boundaries through a family office, family businesses are better prepared to play freely in the market with competitors and business partners. There becomes a clear distinction between managers and investors, family-related risk is better managed and issues such as governance and succession planning are handled more fairly. Fairness is paramount to a family business’ survival: fair processes create improved decision making. Solutions that are perceived as fair by the family and business stakeholders are more likely to be accepted and supported. Fair process lays a foundation for continued family participation over generations, and acts as a long-term plan for stakeholders such as owners, staff and clients that places overall continuity at the heart of business strategy. The family office also frees up family members to choose the degree of involvement they wish to have with the business, from being just shareholders to actually working as professional employees. Often, the skills that founding family members demonstrated in establishing a start-up business turn out to be less relevant after the company has moved beyond its initial phase. Giving the family more choice in their role, whilst retaining part-ownership, can vastly benefit the company: the company becomes free to seek employees with experience and skill sets more suited to growing an established enterprise. Likewise, leadership in the business tends to get stronger, as non-family members fill roles that family members no longer have the desire to do. This structure is why government policy makers, economics and academics around the world have come out in support of family businesses. They have quickly become a source of large wealth creation and employment for whole communities – an industrial economic model is out and one of entrepreneurship is in. The cultures that runs through family businesses are fostering security, loyalty and a sense of being that post-2008 crash employees are craving. 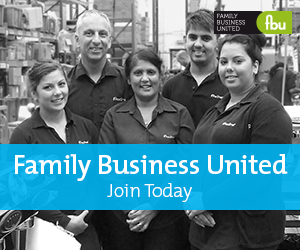 A well-governed family business can expect a prosperous future for many years to come. Nest Investments has recently reached ‘tipping point’ as a family business. We have set out to separate the business from the Abu Nahl family in all matters except shareholding. It has been a long and often difficult process, but it is one that we know will serve the company, its employees and the family best in the long run. The outcome will soon come into being, but one thing is certain: the unique DNA left behind by the family’s values and ethics will remain, inescapably, at the core of everything we do. Nest and the Abu Nahl family, as first and second-generation adults, are determined to make sure that the early days of the family office are guided and nurtured by professionals, blending insider experience with fresh new insights. For better or for worse, it is this unique cultural blueprint that sets the business apart from others and lays the foundation for a long future of business success. If your family business is looking for longevity, we recommend the creation of a family office. Establishing one can be just what a family business needs to professionalise and ultimately mature an enterprise.